12:00 PMOn Wednesday, I chopped it with SportsCenter’s Reese Waters. We talked about The Bachelorette, sports, ESPN’s 30 for 30 O.J. : Made In America, among many other things, including Gucci Mane. Have a listen, kiddos. It was a fun one. I happened to be in Los Angeles when the UCLA shooting broke out. It was odd, because they happen so often in general, that even the kids on campus thought it was a joke. School shootings, for the record, are always terrifying. And when you’re in a town you’re not from when something like that happens, it’s a strange feeling. That said, the story itself is extremely sad. Police say it was a murder-suicide, and while it might make for the so-called least damage in terms of number of humans, it’s still very awful. ABC News’ Josh Margolin, Julie Sone and Meghan Keneally report. Steroids are a very polarizing topic. Many believe that taking them makes you less of a human, even though they are designed to make you more of one. Interestingly parodoxical irony, but whatever, it is what it is. Personally, steroids from a morals standpoint do not bother me. Do what you gotta do to win, but understand the risk you’re putting on yourself. That said, Russia has been about this life for some time. And by that I mean, since before I was born. And what’s awkward is that they always get caught. FiveThirtyEight’s Christie Aschwanden wonders if it’s fair to ban them altogether. Have you ever seen a white BMW X6? No? I’ve got many zero in my driveway right now, so, me neither. But, from what I understand, they look like a panda. No, seriously. An artist named Desiigner made a whole song about this concept, among other things, and it completely rocks. Never mind all that, I happen to love pandas, as animals. It took me a long time to come to this opinion, as I’m from Washington, D.C., where people go completely insane about these bears. So, since it’s Thursday, here’s a picture of a panda holding her baby in her mouth. The NBA Finals start Thursday night. It’s the beginning of a long, two-week journey in which basketball … yatta yatta whatever, Stephen Curry vs. LeBron James. Let’s be real. These two guys are currently the most important people in the basketball world and both have legacies to cement. The last time James wasn’t playing in the Finals, Curry was barely in the league. And remember what he was doing before that? Going nuts at Davidson? Well, he impressed The King there, too. Literally. Watch ESPN’s Jalen & Jacoby talk about this modern day David vs. Goliath story. Coffee Break: Dumb sports franchises do dumb things. Some let non-smart people run their operations. Others let their players do whatever they want and look the other way. But this is all human nature, as Michael Jackson would say. And some franchises, like one from my hometown of Washington, D.C., let medical records about their personnel get stolen. Yikes. Snack Time: Soccer in this country needs a lot of work on more levels that just what the men’s national team is not doing. 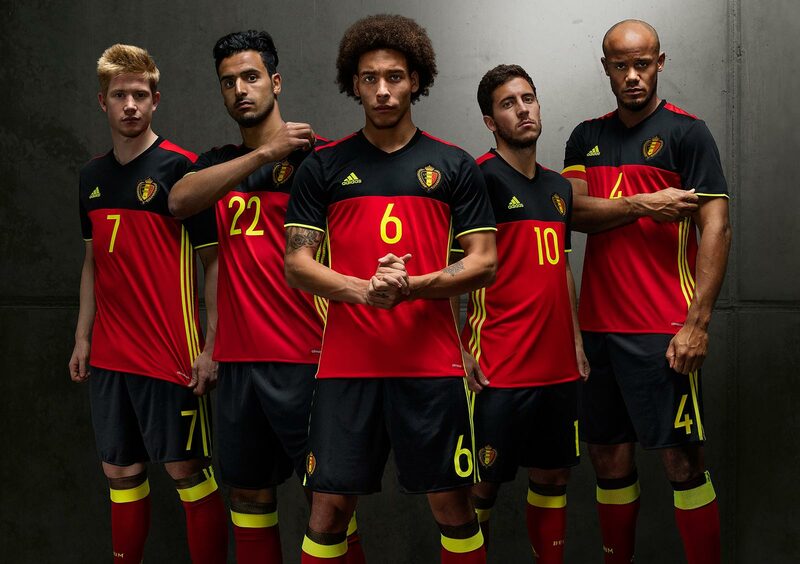 Read this story about how the concept of diversifying the game is an inherent problem in the U.S.
Dessert: Belgium should be ashamed of itself for rocking these kits. You can’t win the Euros looking like this. 4:01 PMShaquille O’Neal is arguably the most popular athlete/entertainer of his generation (Dwayne Johnson is his only comparison), and occasionally he busts out something so virally funny that it’s impossible not to like. This time, he’s teamed up with the ride-share company Lyft to execute that “riding undercover” bit, that is surprisingly effective with lesser-known players. But come on, Shaq? Nobody on EARTH is getting into a car and just acting like they don’t know that he’s the driver if they look at him. He’s an insanely large human, has an extremely unique voice and is on TV constantly. I refuse to believe that there are people in Atlanta of all places who don’t recognize him. That aside, this video is hilarious. The costumes alone are enough to do this justice, but O’Neal ad-lib skills are tremendous. A dashiki and an Afro wig? Yes, please. The best part of it is in the very beginning though. “My favorite Laker player is Kobe,” a woman says, laughing, to an obviously unmasked Shaq. Per usual, he takes it like a champ. If someone in Major League Soccer was smart, they would sign Adebayo Akinfenwa instantly. If you don’t know who he is, I don’t blame you. For some time now, he’s been sort of a fun, underground fan favorite of people who watch way too much lower-league English soccer. He’ll turn up every once and again in an FA Cup match somewhere and people will gawk at him, but he’s been playing professionally for nearly 15 years. It’s not quite clear what his exact body weight is, but don’t get it twisted: My man can move. And he plays striker, which makes everything more amazing. His size is both a plus and a minus from a marketing standpoint. His nickname is “The Beast,” which is a tad pedestrian but we could fix that right up, here stateside. But he’s famous enough to have parody accounts too, obviously. He’s had interest from MLS teams before, and it’s time to make that happen. This guy is a star waiting to happen. Check out his interview after AFC Wimbledon won the League 2 playoff Monday. He’s the kind of guy that actually says “sidebar” in regular conversation, which means he’s my kind of person. And if soccer doesn’t work out, a WWE career is there for the taking. Akinfenwa scored a late-game penalty on his way to helping Wimbledon to promotion. But he was released by the club — a fate he was aware of heading into Monday’s game. I can’t wait to root for this Brit on American soil. Over the past couple years, Pusha T — once half of the legendary duo The Clipse — has established himself as one of the smartest men in music. While still keeping his raps primarily focused on his narcotics-selling past and his entertainment industry present with a healthy cut of political commentary, he’s stayed relevant by pushing the envelope as president of G.O.O.D. Music and creator of the Play Cloths line of streetwear. But this week started with a bang and ended with a banger. First, a run-in with potentially the only person more important to Virginia’s hip-hop history: Allen Iverson. The recently inducted basketball Hall of Famer and Hampton native A.I. showed up with a signed jersey and Push lost his mind. For real, jumping up and down like a little kid, which is exactly what every single person in the world would do in that situation. Then, as if that weren’t enough, he turned right around and dropped a genuinely vicious track with Jay Z of all people called Drug Dealers Anonymous. Aside from the fact that this Jay Z verse is actually good, there’s an added value in that they threw in a clip of a rant from The Blaze’s Tomi Lahren. You can check out the full thing here, if you like. It’s been a great week for King Push, just check out the look on his face. And we’re still two days away from a potential G.O.O.D. Friday. 9:46 AMWe’ve got a palindrome as the date today, which is always fun. I’ve been in Los Angeles in the lead-up to the premiere of the Ezra Edelman film O.J. : Made in America that will air starting June 11. Trust me, you do not want to miss this. Every year, thousands of people cross the Mediterranean Sea. Many of them are doing it to try to save their lives. Whether they’re from East Africa or the Middle East, various refugees regularly endure horrible conditions on the water for even the slightest shot at a better circumstance, often risking everything they have to do so. This week, nearly 1,000 people have died on said mission and one photo has come to really embody that entire struggle. ABC News’ Michael Edison Hayden reports on the image that’s gone global. Remember Michael Jace? The brother who was in The Shield on FX? A little more than two years ago, he shot and killed his wife in a domestic dispute. Tuesday, he was found guilty of second-degree murder. April Jace was a track athlete and the couple had children together. At the time, it was a chilling account of a man who shot his wife, then called police himself to report the incident, saying, “I shot my wife.” Now, court details of what actually happened revealed that Jace basically did it because she wanted to leave him. ABC’s Jovana Lara and Lesley Messer report. Once Donald Trump clinched the GOP presidential nomination, no one was shocked. It felt like an absurd reality in a way that was tough to explain, but after watching months of the Republican Party trip and fall all over themselves while a New York real estate guy basically engineered a hostile takeover, you figured it would happen. The question came in whether they’d back him if he got that far. Well, it appears they are. His support numbers are on par with other presidential candidates from within the party voters. FiveThirtyEight’s Harry Enten explains and discusses Trump’s actual chances at winning. If you think the Zika virus is just some faraway threat, think again. With the Olympics coming up in Rio de Janeiro soon, many athletes are expressing major concerns. Also, think about this way. Half the athletes there will be women of child-bearing age, the greatest risk group when it comes to the illness that can cause children to be born with encephalitis. And all those women will be going back to where they came from. It’s a scary thought if there’s an outbreak. But you know who actually DID catch it? The Tigers’ Francisco Rodriguez. ESPN’s Katie Strang tells it. Coffee Break: There was a time in my life when mini-golf was my absolute favorite leisure activity in the world. I feel like that was probably the summer between fourth and fifth grade. Good times. Anyways, it’s nearly impossible to find a decent course these days unless you live in Myrtle Beach. What happened? We need to know for the summer. Snack Time: If you’re wondering why disenfranchising voters because of felony convictions is a big deal, it’s not just a matter of right and wrong. If you were wondering, yes, that practice started based on racist policy, too. Dessert: New Chance is Old Chance to commemorate Bold Chance so, yay Chance.